Modern standardized methodologies, described in detail in the previous chapters of this book, have enabled the software-automated design of optimized DNA construction protocols. 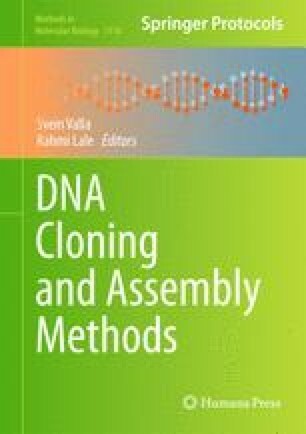 This chapter describes how to design (combinatorial) scar-less DNA assembly protocols using the web-based software j5. j5 assists biomedical and biotechnological researchers construct DNA by automating the design of optimized protocols for flanking homology sequence as well as type IIS endonuclease-mediated DNA assembly methodologies. Unlike any other software tool available today, j5 designs scar-less combinatorial DNA assembly protocols, performs a cost–benefit analysis to identify which portions of an assembly process would be less expensive to outsource to a DNA synthesis service provider, and designs hierarchical DNA assembly strategies to mitigate anticipated poor assembly junction sequence performance. Software integrated with j5 add significant value to the j5 design process through graphical user-interface enhancement and downstream liquid-handling robotic laboratory automation. Conflict of Interest Statement: The author declares competing financial interests in the form of pending patent applications related to the j5 software, and equity in TeselaGen Biotechnology, Inc. This work conducted by the Joint BioEnergy Institute and the U.S. Department of Energy Joint Genome Institute was supported by the Office of Science, Office of Biological and Environmental Research, of the U.S. Department of Energy under Contract No. DE-AC02-05CH11231. The author thanks Joanna Chen for constructive comments on the manuscript.